Whether you need a prototype, small quantities, large quantities, or a long-term supply with scheduled deliveries, Nowak Precision Machine will work with you in any situation to provide the highest-quality product on time. Nowak Precision Machine is organized to act quickly and accurately from the preliminary stages through production and delivery. Mark Nowak is on the floor daily, mentoring the next generation of machine shop experts and applying strict quality assurance polices generated over lifetimes in the machine shop field. Nowak Precision Machine’s dedication to customer satisfaction is managed through our MRP software, which allows Nowak Precision Machine to quote, order materials, process, track, monitor, ship, and invoice with the same program. Nowak Precision Machine gets into production faster by designing solid models for CAM software programs and correctly processing drawings the first time. Nowak Precision Machine utilizes unique design management tools and engineering aids that help us eliminate errors, reduce development times, and decrease costs. Multiple Cam-software programs help Nowak Precision Machine produce new products quickly and efficiently. It makes NC programming faster, easier, and more accurate through proven repeatability. 30 HP CNC machining centers with automatic pallet changing, four axises, and 10,000-RPM spindles enable Nowak, Inc. to hold tolerances to tenths on a large window of machine part sizes and materials. Quality, accuracy, and the most competitive prices around are the what you can expect from Nowak. Our highly accurate high-speed turning centers have live tooling which allows milling and secondary machine operations with one chucking. This increases our accuracy and efficiency. Nowak Precision Machine Shop has automatic screw machines capable of handling stock diameters up to 2 5/8 ". 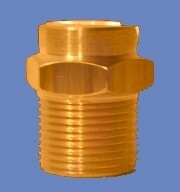 Typical product runs for the Screw Machines are from 10,000 to 100,000 pieces. We have single-spindle automatic screw machines capable of handling stock diameters up to 1 5/8". Typical production runs for the Brown & Sharpe Screw Machines are from 100 to 10,000 pieces. Nowak Precision Machine Shop has CNC lathes that can turn bar stock up to 26" in length and up to 2 1/2" in diameter through the spindle. Our four vertical machining centers can handle any work in the 40" x 20" x 20" envelope with true fouth axis capability. We utilize the fastest CNC Machining Centers available to ensure short cycle times and competititve pricing while providing the highest-quality parts possible. 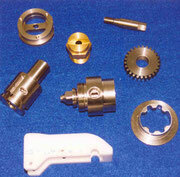 In addition to screw and CNC capabilities, Nowak Precision Machine Shop also provides CNC Swiss machining. Swiss machining refers to the production of small high precision parts that typically have a large length-to-diameter ratio. These machines are equipped with main and sub spindles and seven axises of control. This allows us to produce complete, complex parts in a single operation. The benefit is the reduction of both scrap material and cycle time. Therfore, we can produce a higher quality part at a more competitve price. In addition to machining individual parts, Nowak Precision Machine Shop provides complete manufacturing assembly, sub-assembly, and packaging for finished parts. We are capable of producing complete units as per your specifications to be delivered at a set rate or on a release basis. Every order is treated with the same care and diligence. All parts are packaged to protect their finishes and quality. When necessary, extra packaging and special handling are employed to protect pieces. Nowak Precision Machine Shop is dedicated to high efficiency and delivering your components to market in a timely manner. Nowak Precision Machine Shop offers secondary operations for all of our products, including assembly, secondary machining, grinding, welding, and hydraulic pressing. We also have strategic partnerships with heat treatment and plating vendors. Our proven secondary capacity allows for speedy delivery, reduced costs and greater quality control by acting through a single source. By purchasing completed units, our customers can significantly reduce raw material and finished inventory expenses.